Sun City's Gary Player Country Club (in South Africa) is the venue of the Third Women's World Cup of Golf. Tournament, which kicks off tomorrow (Friday, the 18th January 2007). But today is the Pro-Am where the sponsors can get together with the professionals and play some golf with them. South Africa and Sweden have been paired together in Friday’s opening Singles. Sweden are the defending champions and South Africa finished in 7th place in 2006. Laurette Maritz and Ashleigh Simon (of South Africa_ will be taking on Helen Alfredsson and Carin Koch (of Sweden) at 1040. The offical opening ceremony was held last night (Thursday)and two houses were handed over to two families whose parents died of AIDS. 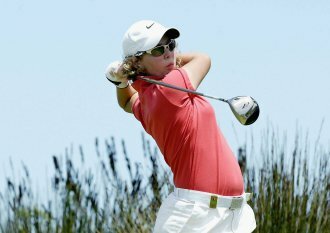 In the inaugural year of the Women's World Cup of Golf, South Africa finished 12th. South Africa are the only team that have been together for 3 years. Laurette Maritz, who's hoping that South Africa finish first (who isn't hoping to finish first! 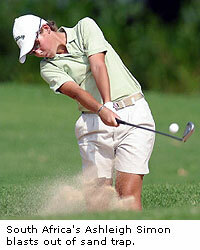 ), knows the course well, as she played there many times as an amateur (although she mainly plays in Europe these days). Laurette chose Ashleigh Simon to play with her, because of her maturity and her ability to play great golf (she won the World Amateur last year) and because she handles herself well off the course (I take it that means she doesn't get drunk and disorderly). Kenya is competing. Golf certainly is moving from the stereotype of a "white male gentlemen only ladies forbidden" sport! The players are playing for $1.2m. Telkom are one of the main sponsors of the competition, I guess with competition slooooooooooowly opening up in telecommunications in South Africa the giant Telekom are needing to build their brand. Perhaps they would do better to improve their services - the Corporate Golfer has been waiting since 1 December 2006 for Telkom to set up a landline and ADSL at his house - with numerous phone-calls to them Telkom have yet to set up an appointment to do the job! Telkom market themselves as being "proudly South African" - if Telkom is what South Africans are proud of then the country's standards are lower than I feared. The giggest competition to the ladies isn't the competition but is the course and the weather (it's going to be hot out there and I'm not just speaking about the gals).